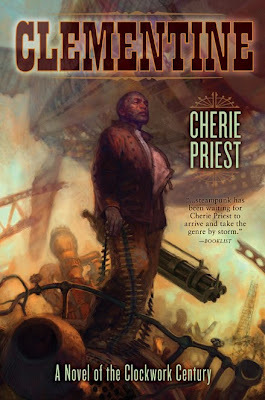 Subterranean Press announced about a month back they were changing the cover to Clementine the steampunk novella from Cherie Priest. They felt the original wasn't quite right and went for something more in line with what Tor has done for the Clockwork Century series using the same artist from Boneshaker and Dreadnought Jon Foster. This is definitely an improvement and jives much better with the contents, which are a bit down a dirtier than the original art reflected. Two other big notes. Sub Press will be doing a trade paper release of Clementine next year for those not wont to shell out for the hardcover and most importantly Cherie announced they'll be at least two more Clockwork Century novels coming from Tor with Ganymede in 2011 and Inexplicable in 2012. Bring on the steam! The first could portend a steampowered visit to space. More details as I find them. This is an AWESOME cover! Wow. There is so much going on and so much to look at. All hints to the book I hope. Thank you for this cover. I have it on my list to get.